November whizzed by in the blink of an eye, and it’s already the third day of December. It may be a little too late to talk about fall foliage in Japan, but after seeing all the amazing fall photos posted by my friends in Japan on Facebook, I just had to get in on the action. 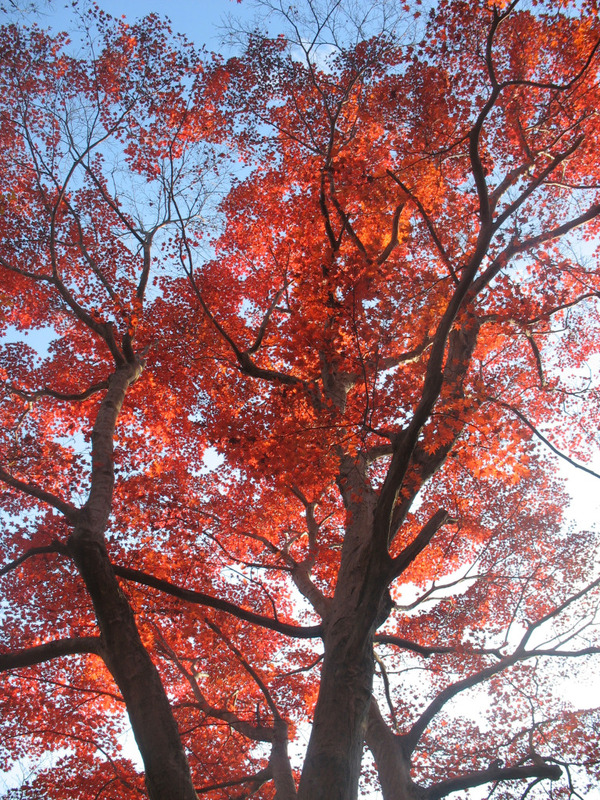 I’d also like to mention that seeing fall foliage in Japan was, quite frankly, one of the highlights of my life. There are some things that are best done in Japan, such as eating fresh sushi or viewing cherry blossoms, and I have to say seeing the fall leaves should rank at the top of that list. In my opinion, the best time to go to Japan is not during the spring to see cherry blossoms; but rather, during the fall when leaves are painted blood red, sunset orange and a golden yellow. There is nothing else like in the world. It should be on everyone’s bucket list. Although it may be too late to visit these spots this year, I wanted to introduce my favorite spots for viewing the fall foliage of Japan. …that is, if you like to be sandwiched between a sea of people. While the fall leaves in Kyoto do turn spectacular colors and the backdrop of some of Japan’s most famous temples create some picture perfect photos, I think the crowds (and prices) make it more of a hassle than a hidden treasure. In other words, avoid Kyoto and try going somewhere else. I know, I rant about Niigata on here more than I should, but I truly feel it is an under appreciated prefecture and deserves more attention. 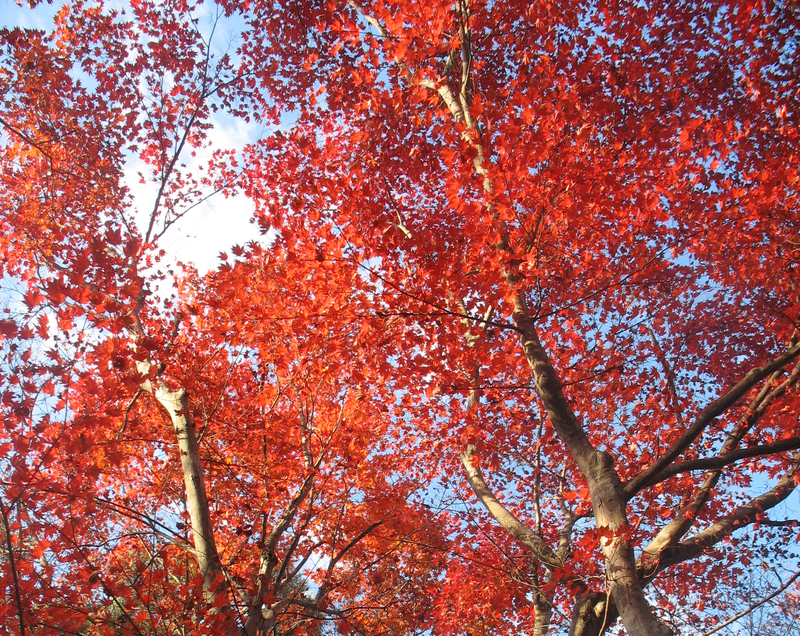 I saw fall foliage in Kyoto, Nagano, Himeji, Toyama–and none of the colors there even came close to what I witnessed in Nagaoka city in Niigata prefecture. Didn’t think trees could turn this red, right? 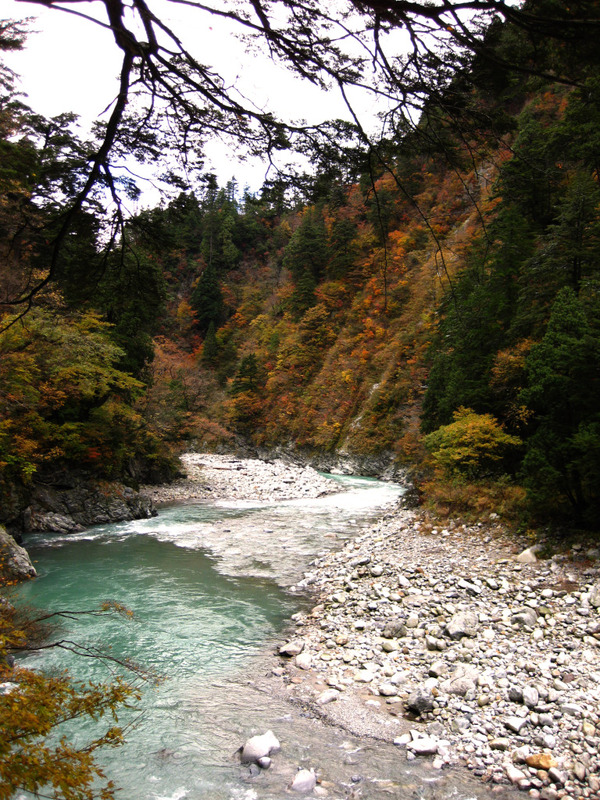 Most of the Hokuriku area in Japan has some stunning fall foliage scenes, with Niigata as a local favorite of mine. 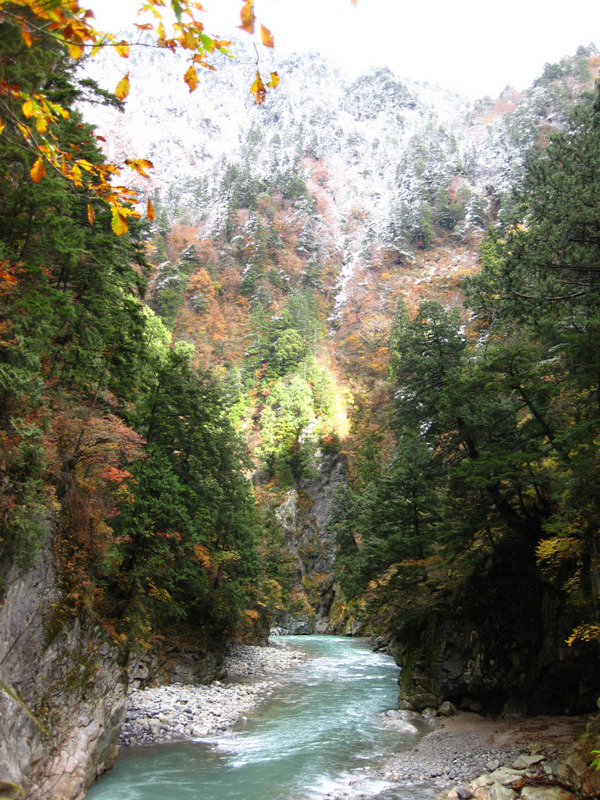 Nearby Nagano prefecture has Kamikochi national park, which blends fall hues and mountain landscapes beautifully together to give you some truly stunning scenery. 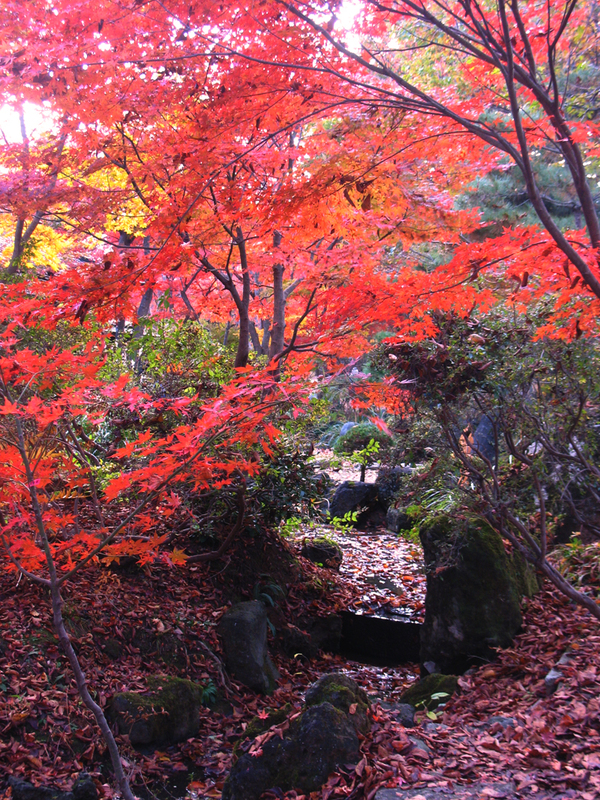 But my absolute, favorite place for fall foliage in Japan? This place is what fairy tales are made of. 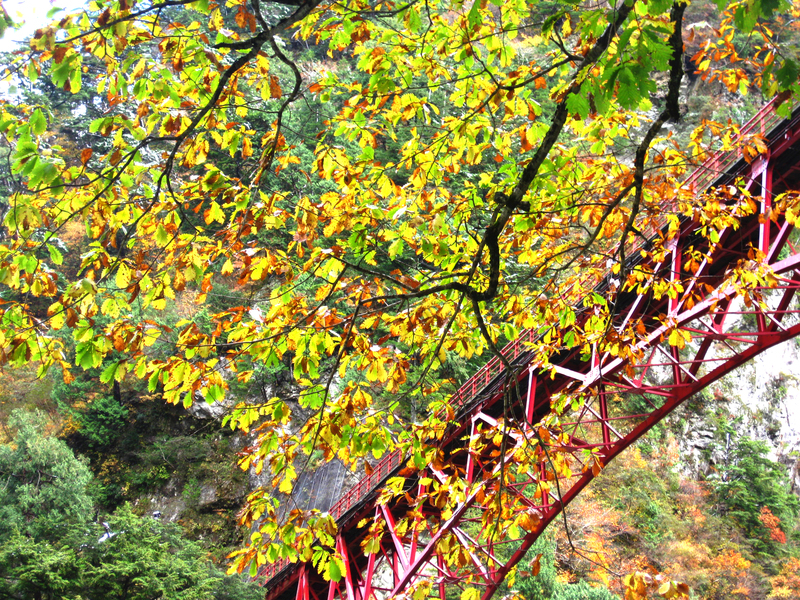 The red bridge connects the outside world of Japan into the inner valleys of Kurobe, a true tribute to nature and a sanctuary of trees, bubbling brooks and towering mountains. While the leaf colors here don’t dazzle as much as Niigata, the overall landscape composition is mind blowing. The translucent water, powdered snow sprinkled on top of the mountains like sugar on a cake, and the rain of golden leaves as they retreat into their winter slumber are all symbols of Japan’s changing seasons. 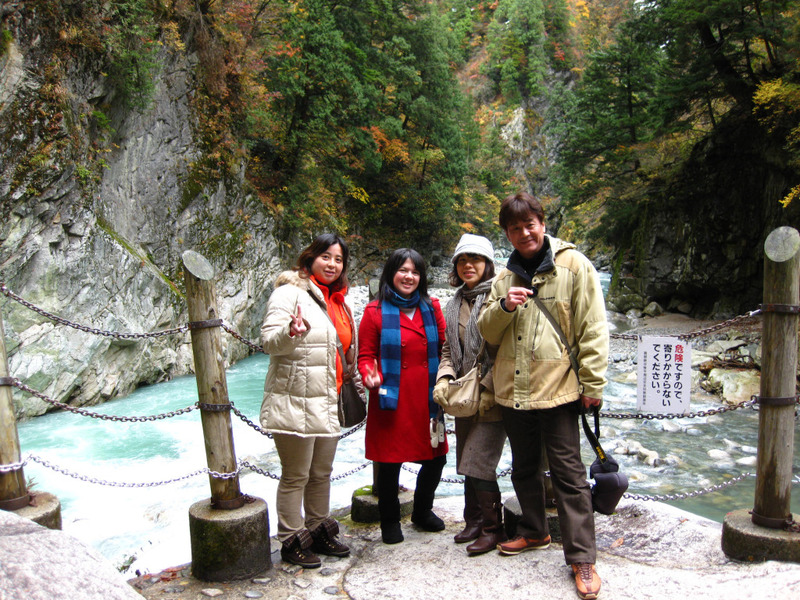 Kurobe valley is a MUST. This vacation was also quite memorable because I went with my favorite teachers at the time. 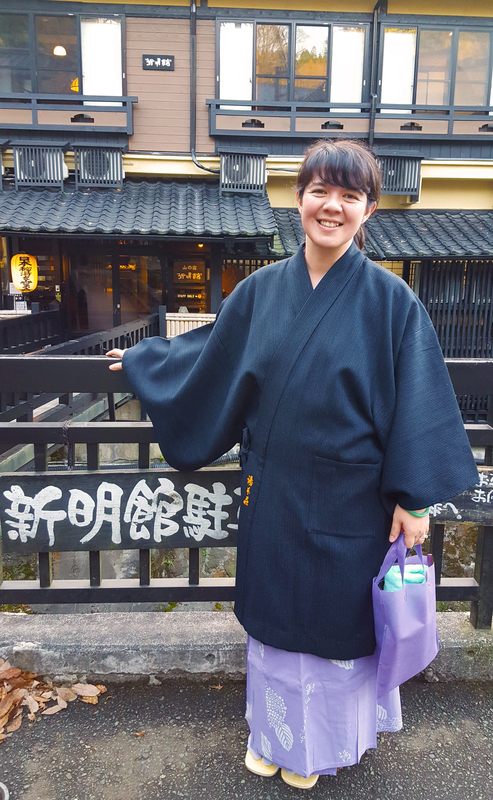 Although I suffered immensely from loneliness when I lived in the countryside of Japan, there were a few teachers that reached out to me as more than just a foreigner in distress or a lonely gaijin: They saw me as a friend. The vice-principal was one of the few Japanese teachers that talked to me not as “that American teacher,” but just as Mary. Halfway through his term as vice-principal, he left the school due to an “illness.” When I asked him about it during this trip, he went into detail about the overwhelming pressures of Japanese society and how he was crumbling under the system, mentally. He was one of the few, and brave, Japanese men I met that put his health–and his family’s–above his job. I was touched that he opened up to me about such a sensitive topic, and talked to me as a friend rather than a foreigner in a strange land. 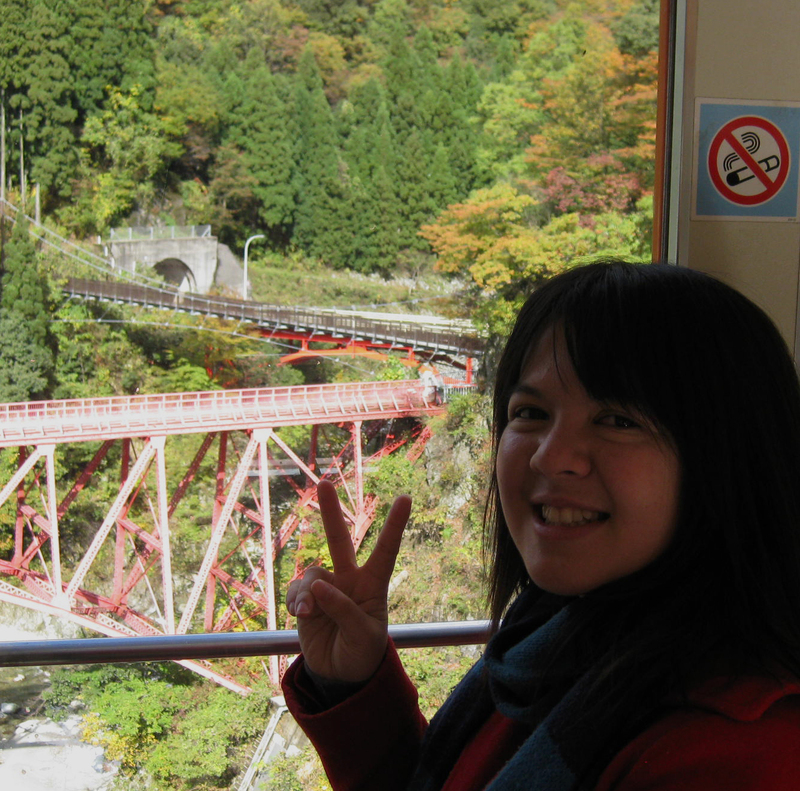 Anyway, Kurobe Valley can only be accessed via the train that runs on the red bridge above. The train is very old school, which means no heating and–yes–no windows. 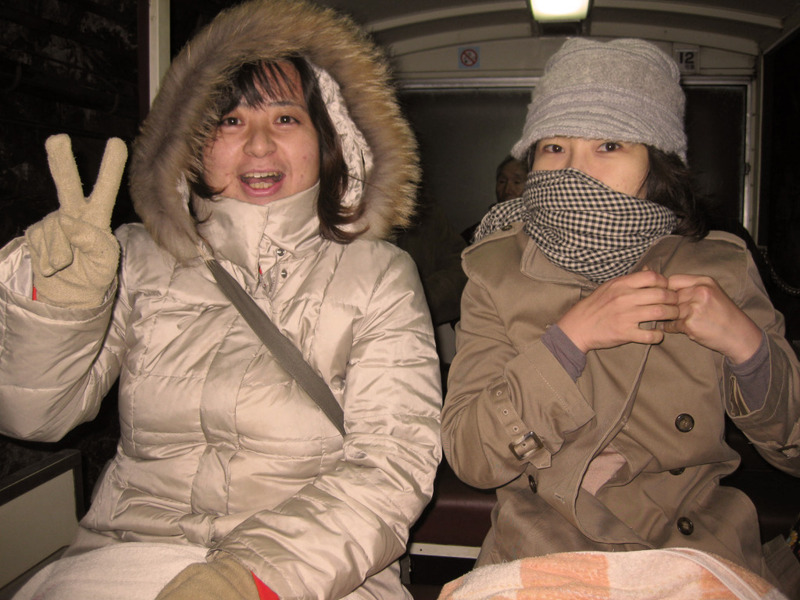 This gives better access to the views outside, but definitely makes the ride a wee bit drafty (thus the vice-principal and I up there are holding Japan’s archaic heating method, the hot pad hokairo). This wasn’t the last trip I went on with the above trio. 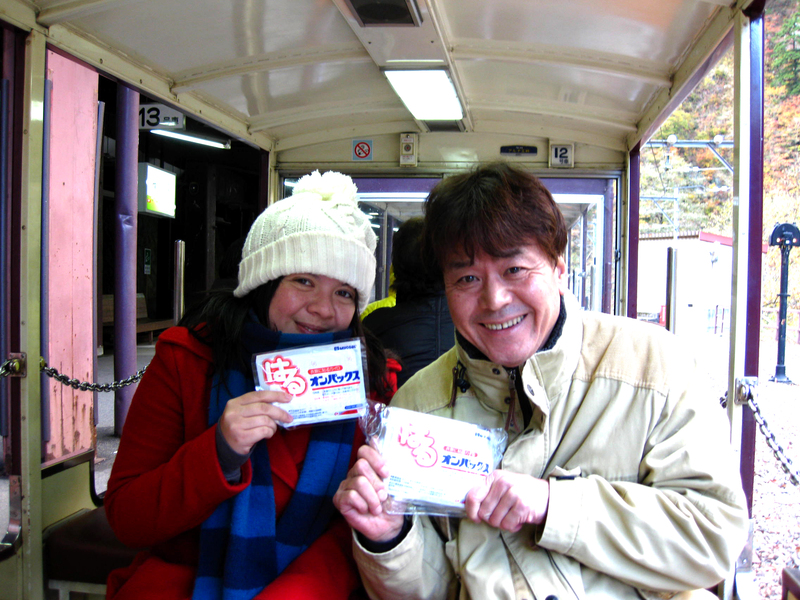 We also explored various parks in Toyama and Nagano, toured the Christmas lights in Karuizawa Japan, and had countless dinners together. Even today, the memory of them remain deep in my heart. I hope somehow, someway, I can see them again. I know, too much reminiscing. While the leaves aren’t as crimson as Niigata, the impeccable outline of the maple leaves in Toyama (momiji) and its cascade of fall hues will leave you in awe of Japan’s beauty. 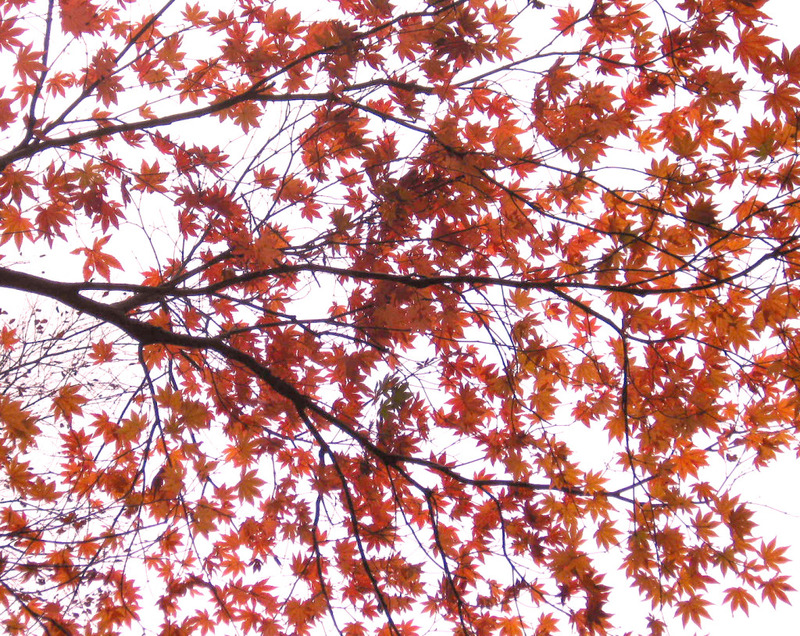 In Japan, the seasons bring more than just a change of weather. The food, the scenery, the customs and even everyday life changes according to the time of the year. 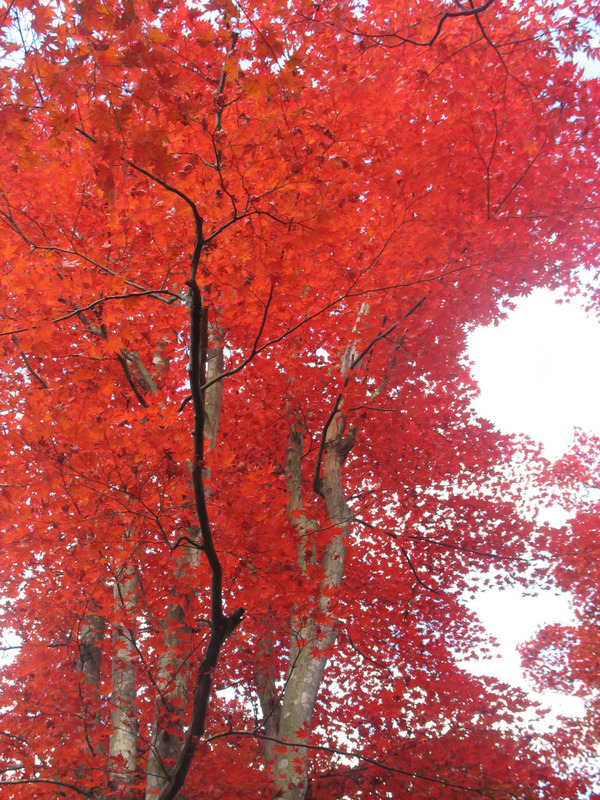 To me, fall in Japan was the end to the relenting humidity of summer. Fall was a draft of fresh air that painted the trees in warm colors of harvest. Fall meant that it was time to bring the kotatsu (heated table) out from the closet and prepped for use. Fall i sthe season to munch on Japan’s juicy tangerines (mikan) after sipping on an ice-cold, autumn flavored Asahi beer. Fall meant it was time to dust off the sweaters, the mittens, the scarves and bring out the coat for the upcoming winter. Whether you’re going to Kurobe Valley in Toyama prefecture or simply exploring a small park full of trees in Tokyo, fall foliage needs in Japan is a definite must on any traveler’s list. And with the yen hitting record lows (180 JPY to the dollar!) now has never been a better time to go. Although my relationship with Japan is complicated, there is no doubt in my heart that I love that country–with fall being my personal favorite. Watching the red leaves is also done in Beijing (the teachers would always ask if we were planning to go 看红叶), but I guess it is not that beautiful (or the smog makes it difficult to actually see the trees, hahaha). I don’t remember much in Shanghai either… (or anywhere even near Shanghai). I guess china is just not a ‘hong ye’ kinda place. I think Japan has the best in the world! They turn amazing colors it’s almost surreal! Absolutely stunning. You have convinced me. Japan has always been on my list, but the cost have kept me away. Those pictures really turned on my heart though. I will go in the fall. It is decided. Thanks for sharing such a wonderful post full of good ideas. Yeah, the yen is so cheap now!! If it drops to JPY 130 I’ll meet you there and we can share a beer at an izakaya, haha. 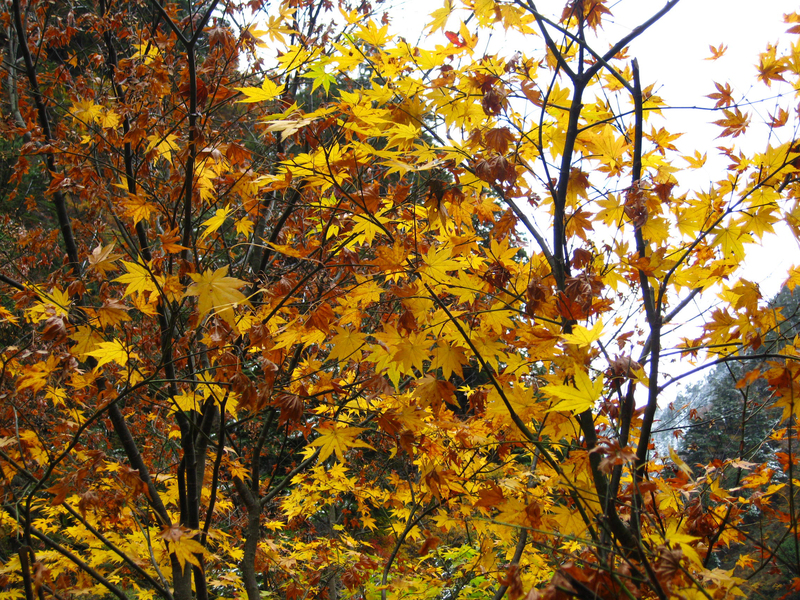 Those pictures are beautiful – actually, they make me miss the foliage from New England. Haha. Yeah I heard that the only good place to experience fall in the states is in New England. I lived in Utah for most of my life, so fall was only about 2 days and the leaves barely turned dishwater blonde before falling to the ground. It definitely paled in comparison to Japan. These photos are gorgeous! I had no idea that Japan was so colorful in the fall. I lived in Xining city, Qinghai province China for four years and in the fall everything turned yellow. It was beautiful too, but kind of weird (I’m used to all the colors Michigan has to offer) but still stunning. Thanks for sharing. This makes me even more interested in visiting Japan. Hi Mary, what date did you take these photos?It looks like the fall colors were at their peak there in your photos. Was it December ?? I am planning to go to Japan Nov 20 to Dec 1. Will these leaves still be on the trees or is it too late? Thanks? Hi Katie! I took these photos the last week of October, usually the peak for leaves in southern Niigata is the last week of October and first week of November. 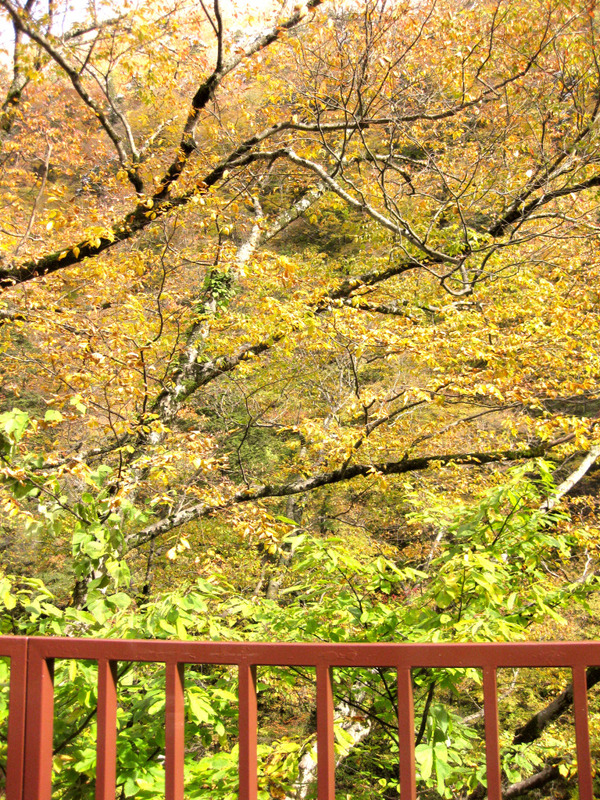 Fall foliage (or Koyo) peaks depending on what area of Japan you are in. Here’s a good summary calendar that will let you know the best peak times for each region throughout Japan. According to this calendar, if you go to Kyoto, Osaka or Fukuoka during the last week of November/first week of December, then you should be able to catch some pretty good fall foliage. 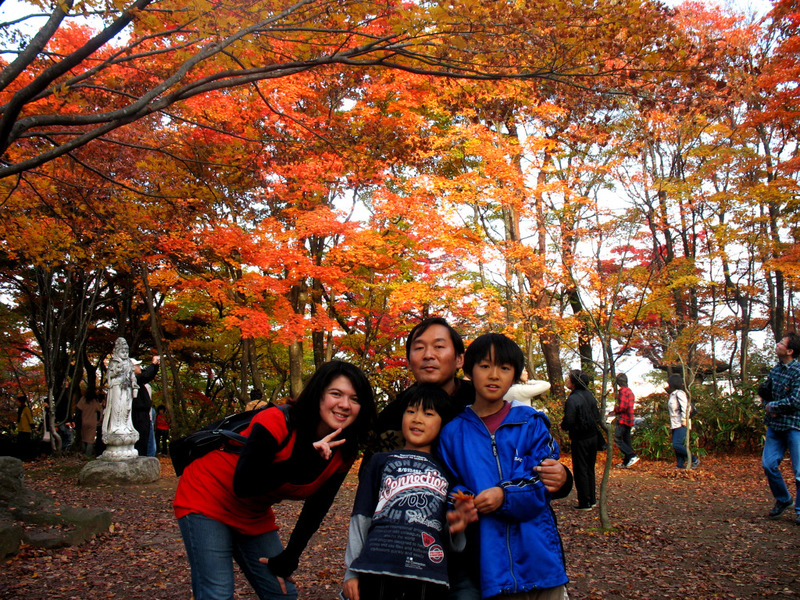 The leaves change colors earlier up north (Hokkaido) and later down south (Kansai and Kyushu area).